You don’t have to be posh to play at Posh Bingo. Posh sometimes has a good meaning and sometimes not so good. So, forget about all that and just join all the fun, make some new and win some posh prizes today. Online bingo site Posh Bingo is one of the most popular bingo sites in the UK. This site underwent an extreme makeover just a year ago and has since emerged as a huge success. With a huge variety of online bingo games and extravagant promotions Posh Bingo has made a place for itself at the top of the pile. This stylish bingo site gives new members £25 as a Welcome Match Bonus. A first time deposit of £10 will get the new member this £25 bonus. There is a further 50% bonus on every subsequent deposit made. Online bingo players can enjoy every variety of online bingo games here. There are free bingo games daily from 10am till 1am and a daily guaranteed free bingo jackpot worth £50 too. Play 90 ball and 75 ball bingo games all through the day. Choose from Penny bingo games with 1p tickets, Speed bingo where just four numbers have to matched on a card, Team bingo where players can win vast quantities of bonus points and make lots of online bingo friends too, and lots of regular online bingo games for tickets ranging from 2p to £2 in price. You can expect many interesting and enjoyable online bingo promotions. Some of these are on as regular promotions and there are plenty of Special promotions that run on weekends or are topical. The bingo lobby is a treat filled with different bingo rooms packed with online bingo games that you can play practically round the clock. You can also access an eclectic selection of Instant games here. There are some super daily guaranteed jackpot game every evening at 7.30pm. With a £100 in the pot this is a neat little jackpot that can be tried for every day. Dream of big money with the Dreams of £1,000,000 game every Friday evening. There is a minimum guaranteed prize of £500 in this Coverall bingo game. The £750 Make a Mint guaranteed bingo jackpot game plays every Saturday night at 9pm. This 90 ball bingo game is a big attraction every weekend. There are two bingo progressive jackpots and four Instant progressive jackpot slot games. Play for these progressive jackpots and you can take home big cash prizes if you can win. The Fluffy Favourites Instant game has a progressive jackpot that is more than £50,000 in value. The online slots games with progressive jackpots are Fluffy Favourites, Piggy Payout, Double Up Ducks and Aztec Rising. The Stiletto and STRETCH Limo are the 75 ball and 90 ball progressive jackpots. The Promotions page is packed with information and easy links to the latest big promotions and all the regular bingo and Instant game promotions. A quick look at this page and you will be up to date with the best games to play and the latest offers too. This UK Bingo site has lots of tempting jackpots and prizes to win. 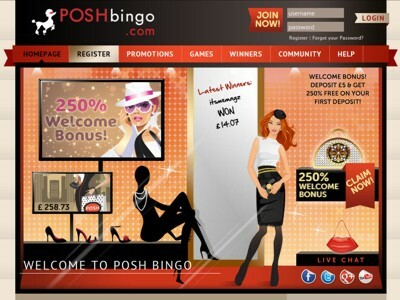 Play the online bingo and the instant games at PoshBingo, it’s the stylish way! PoshBingo.co.uk is now portable! Play 90 Ball Bingo and a selection of instant games on the brand new Android smartphone, iPad and iPhone apps! NEW PLAYERS! Make your first ever deposit via the app and get a Posh 250% Welcome bonus! If you enjoy playing slots games than try your luck at PoshBingo. There are lots of awesome games including; Bejeweled Slots, Fluffy Favourites, Shaman’s Dream, Cleopatra Slot Game and many more. This bingo site has been tested, reviewed and approved. You are guaranteed to play bingo in style! Loyalty Program: They will reward you with bonus point for many of your actions such as referring a friend, playing games and more. Later, you can convert these points into cash in your account or exchange them for other special treats they may offer you from time to time. Start out with a huge 250% Welcome Bonus PoshBingo.co.uk. With so many great prizes and opportunities to play bingo and win, Posh Bingo truly is your best option for UK bingo!